14 years to the month since local presentation in ITV regions was axed in favour of a national, corporate brand, Northern Ireland's station on the Channel 3 network is starting the new week with a new corporate look. Following the acquisition of UTV by ITV plc earlier this year, the first major on-screen changes are taking place. Although ITV has promised to keep the UTV brand alive in Northern Ireland for the time being, the Northern Irish station becomes ITV in all but name, with the long-awaited new look on-screen from 5:59am on Monday. Full-time playout for the station moves to London, following several weeks of dual-running between Belfast and London, during which the new logo accidentally appeared on-screen for a short time. UTV's schedule of local programming has been amended so that its shows fit into standard opt-out points within the ITV Network's main schedule, including the new View from Stormont programme on Monday nights. And the station's news bulletins also get a makeover with the new look. New, but apparently temporary signage has gone up at UTV's HQ at Havelock House in Belfast. 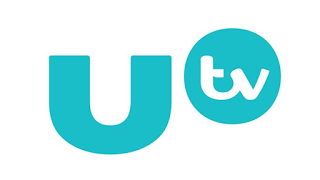 On Friday, ITV confirmed it would vacate the site in the next two years, as UTV is downsized following the centralisation of roles within the ITV Network. Staff still working at the station fear that ultimately, UTV will just consist of a small newsroom and studio facility to produce the legal minimum requirement of news and current affairs programmes. A number of staff face redundancy, with further job cuts expected. ITV has insisted it will continue to invest in the station. 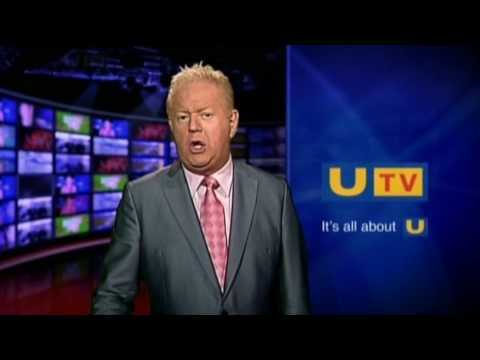 In-vision continuity has been axed as part of the change, with UTV stalwart Julian Simmons (pictured) - known for his famous phrase "but now on the UTV" - making his final announcements in front of the camera over the weekend; all future continuity announcements will take the form of a voice-over accompanying a new set of ITV-inspired idents, bringing presentation in line with other UK television channels. Julian Simmons made a one-off appearance on BBC One NI in October 2012 to announce the last programme on analogue TV, The Magic Box, which was simulcast on both channels. The changes prompted TV presentation enthusiasts and former UTV employees to share and celebrate their memories of UTV's history on Sunday under the hashtag #UTVday. Despite the internal and on-screen changes to UTV, there are no changes to the reception of the channel, and its timeshift service UTV+1 will continue to be absent from satellite TV services for the time being. UTV Ireland, the channel for viewers in the Republic of Ireland, is unaffected by this week's changes north of the border, however it soon will undergo a transformation of its own following a takeover by the company behind TV3. The deal has already cleared the competition authority and the Broadcasting Authority of Ireland, but is still awaiting the green light from Ireland's Minister for Communications. 14 years ago in October 2002, the regional names of the ITV stations across England, Wales and the Scottish Borders were taken off screen in favour of a united brand and centralised presentation from London. Following the formation of ITV plc in 2004, ITV began to standardise the look and style of regional news and current affairs programming. Under the terms of its broadcast licence, ITV is currently committed to broadcasting a certain quota of local news and current affairs programmes in each region until the middle of the next decade.